I was recently given the opportunity to be featured on an awesome blog The Shopping Mama. I curated a page for their Holiday Shopping Guide which is awesome. Check out my recommendations below! These products will enhance your bath time and relax even the hardest working soccer mom out there. This set includes 5 lush holiday Bath Bombs that are not only amazing but also vegan! Includes 16 buttery smooth, highly pigmented, gorgeous eyeshadows in complimentary matte and shimmer shades. You also get an eye primer and liner to complete your eye makeup look. This palette is perfect for every day neutral looks but it also has shades that can vamp up a date night look. $32For the low maintenance mama who likes a clean face, moisturized skin and a little balm to brighten up the day, this set is perfect. It comes with an amazing facial cleanser that works with all skin types, a much raved about body cream and a lip balm that not only nourishes the lips but also gives a lovely sheen of color. $32.50Four great lip glosses that are pretty and also sheer enough for every day use. These glosses are not sticky and look good worn alone but look even better over lipstick. This palette is definitely for the makeup lovers. Twenty bold, bright, beautiful eyeshadows that are easy to apply and leave practically endless options for beauty looks. With this set you will get three full sized products which include a pore minimizer (which everyone needs or thinks they need), an awesome mascara, and a cheek highlighter, for that dewy glow. It also comes with a great mini lipgloss. All these products are encased in a gorgeous pop-art inspired makeup tin that will look great on any vanity. 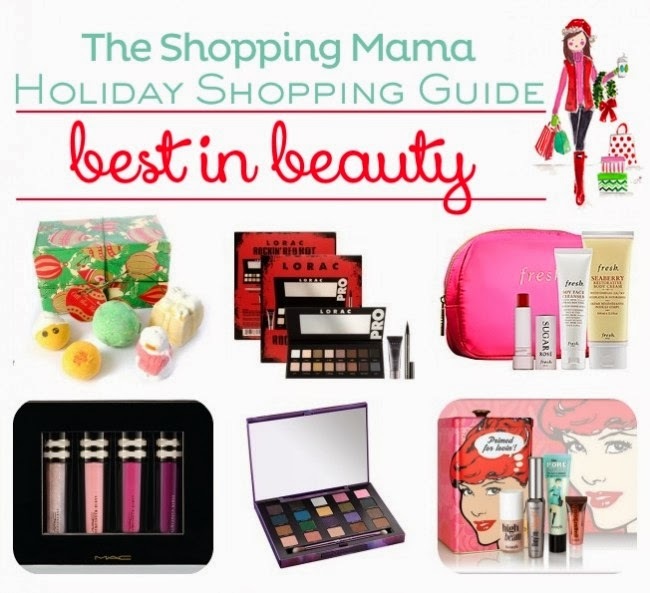 Hope you guys like my recommendations and definitely check out The Shopping Mama. Also, if you have any holiday recommendations, leave them in the comments section so I can check them out!